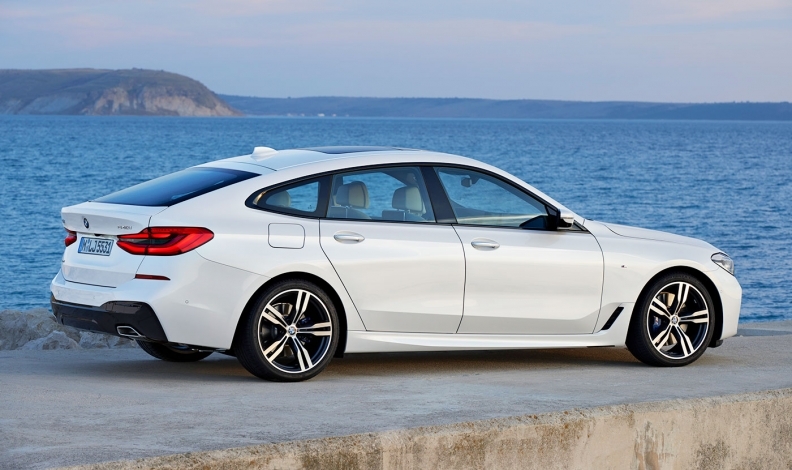 With five doors and a greenhouse styled like a coupe, the 6-series GT provides more legroom and rear headroom than a conventional sedan and combines luxury sedan comfort with the aesthetic appeal of a coupe, BMW says. BMW will launch global sales of its new 6-series Gran Turismo in November, two months after the car's debut at the Frankfurt auto show in September. The five-door 6-series GT joins the lineup just months after BMW's 5-series Gran Turismo went out of production in February. Though the 6-series GT is also based on the 5 series architecture, BMW called it an "evolution" of the 5-series GT. "We are staying away from calling it a successor because the car has gotten substantially larger in size and the positioning has changed," BMW of North America spokesman Alex Schmuck said. "It's definitely a 6-series Gran Turismo." In Europe, the 6-series GT's engine choices will be two gasoline engines - a 258-hp 2.0-liter four-cylinder and a 340-hp, 3.0-liter six-cylinder - and a 265-hp 3.0-liter six-cylinder diesel. In the U.S., the 3.0-liter, six-cylinder gasoline unit will be the only engine choice. In the 6-series lineup, the 640i xDrive Gran Turismo joins the 6-series Gran Coupe and the 6-series convertible.